What is Grass Fed Beef? 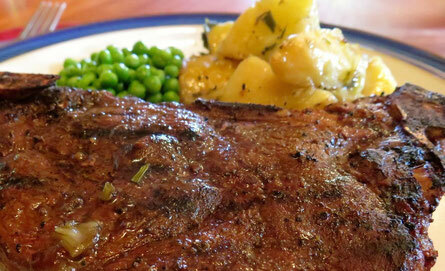 - Pure Island Beef Co.
Grass fed beef comes from cattle fed on a grain-free diet of grass and legume forage. It’s prized for higher levels of omega-3s and other good fats – just like you’ll find in cold water ocean fish. Lab studies prove that the benefits of 100% grass-fed beef are real, but Pure Island beef also has something that most other grass-fed beef doesn’t. Our beef has enough fat for full flavour and dry aging. This is rare in the grass-fed world, and it makes a big difference. Click to see what full dry aging is all about. Although the people use the term “grass fed”, we actually prefer “grass finished”. This refers to the feeding that happens as our cattle are getting ready to be processed. Our unique approach to raising cattle means our 100% grass-finished beef is capable of being aged at least 30 days, and this delivers strikingly better flavour and tenderness. But it takes more than just feeding cattle any old kind of grass to make this happen. One of the thousands of round bales of dry hay that make up our annual feeding program. As crucial as hay is, it’s not the most important thing behind our year-round supply of tender, dry-aged grass fed beef. 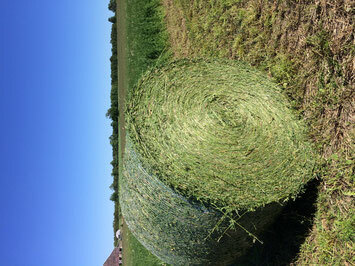 Dry hay is a mainstay of winter feeding in beef cattle farming. But typical dry hay is simply not nutritious enough to pack on the required pounds and the right amount of marbling to allow the dry aging that creates our signature taste and tenderness. That’s why we raise our grass finished beef differently. 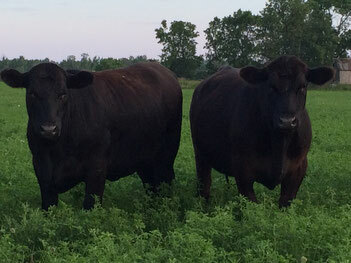 Some of our Angus cattle on pasture for the summer on one of our Manitoulin Island ranches. Our cattle do well in pastures like this one with shaded areas provided by small trees. Proper grazing is gentle on the land, it uses no fossil fuels, it’s good for the farm and it’s good for our animals. That’s why we make full use of rotational grazing on Manitoulin pastures from May to early fall. Great pastures really are the best food for cattle when it’s available. We pasture hundreds of acres of land and we make full use of this option whenever we can. Most of our pasture has shallow, mineral-rich soil, but lack of depth means it can’t be used for any other kind of food production. Cattle turn this land into high quality protein. One of the hundreds of acres of rich forage fields we harvest for hay and haylage. Exceptional grass fed beef only happens with an exceptional year-round feeding program. While cattle are grazing, we’re busy making dry hay plus a special winter feed called “haylage”. 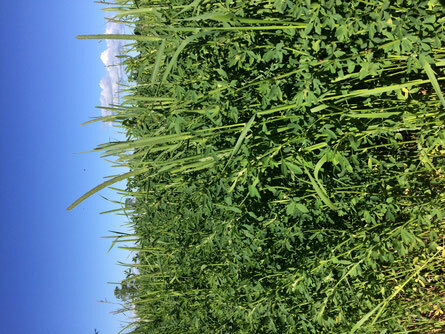 We make it by harvesting our most nutritious, highest-protein hay fields, then packing the forage in an oxygen-free environment while it’s still partly moist. Haylage is the next best thing to summer grazing, and it’s our secret for producing a year-round supply of 100% grass-finished beef with enough fat and marbling for no less than 21 days of dry aging. That’s what makes Pure Island grass finished beef simply the best there is, and we do it without grains. Dry aging is to beef what careful cellaring is to fine wine. It’s the process of letting sides of our grass finished beef hang undisturbed in a refrigerated space for at least 21 days, allowing the natural enzymes to relax meat fibres while also enhancing beef flavour. Does dry aging really matter? Absolutely! It makes an enormous difference in the eating experience, but not all beef is capably of being dry aged. Only meat with marbling and sufficient fat cover, or ‘finish’, can be dry aged in the first place. And even then it takes skill and patience to make it happen properly. Learn more about our dry aging process here. Most people have never experienced the taste of well-marbled, dry-aged beef because you won’t find it in most supermarkets. All our beef is tenderness tested twice before it leaves our place bearing the Pure Island name. Yes, we tenderness test each and every animal in two ways before it earns the Pure Island seal of approval. Some animals are genetically predisposed to have more tender meat than others, and we look for this trait with DNA sampling. As a final check we actually taste-test a small portion of each side of beef before it goes out. Yes, tasting rich, tender, flavourful beef is a tough job, but there’s nothing we won’t do to make sure you’re happy.